Putting himself forefront to protecting the status of the local population in Gilgit-Baltistan, activists within the Awami Workers Party are starting a new advertising campaign to promote the release of their Vice-President, Baba Jan. Recognised as one of the leading voices for the protection of the community, Baba Jan’s prolonged stay in custody has led the party to campaign tirelessly for his release, with the prospect of local elections pending in the region. 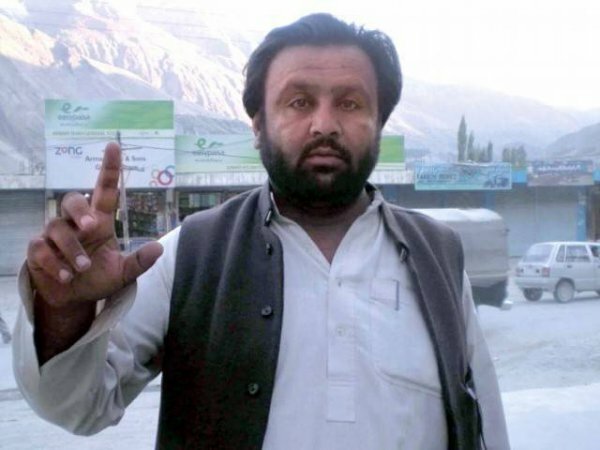 Left wing activists in Gilgit-Baltistan have decided to launch a worldwide campaign to release the jailed politician, Baba Jan. The decision came days after the G-B Supreme Appellate Court upheld a decision of an anti-terrorist court which sentenced Jan and 11 others to life imprisonment for setting government property on fire during riots that erupted in 2011. The riots broke out after a father and son were allegedly killed by police. The G-B apex court also set aside the verdict of a chief court which allowed Jan to contest the upcoming by-elections for GBLA-6, Hunza from jail. “We are with all those political workers languishing behind bars and urge human rights activists and democratic forces in and outside the country to come forward and help us secure their release,” said Awami Workers Party Hunza President Zahoor Ahmed while addressing a rally on Sunday. The rally, organised in Nasirabad, Hunza, the hometown of Jan, was attended by activists in large numbers. The charged crowd in the ‘Free Baba Jan’ rally accused the G-B government of keeping Jan out of contention to avoid imminent defeat in the by-elections. The participants believed the popularity of Jan had upset those sitting at the helm of affairs. The rally demanded a judicial enquiry report on Hunza riots be made public. It was conducted after G-B’s apex court took a suo motu notice of the incident. “Those involved in the tragedy should be punished,” said another speaker, referring to the killing of father and the son in 2011. AWP women’s wing secretary Nazneen, Gojal tehsil President Akhon Bai, Amanullah and others also spoke on the occasion. Meanwhile, AWP overseas chapter announced it will hold a demonstration outside Pakistani High Commission in London and Birmingham for the release of Jan.